The stunning Bianchi Sprint is an all new bike for 2019, inspired by one of their iconic race bikes of the past. Launched in the 1970s, the original Sprint was loved by riders of the time, and is much admired still as an iconic piece of cycling’s history. The new Sprint is created in the same mould as its predecessor – it’s a road racing bike that is accessible to everyone, not just those involved in the world of competitive road cycling. The Sprint’s sleek new carbon monocoque frame is constructed around a classic fast road geometry, providing a perfect rider position from which to chase down attacks, launch breakaways and sprint for mid-race primes. 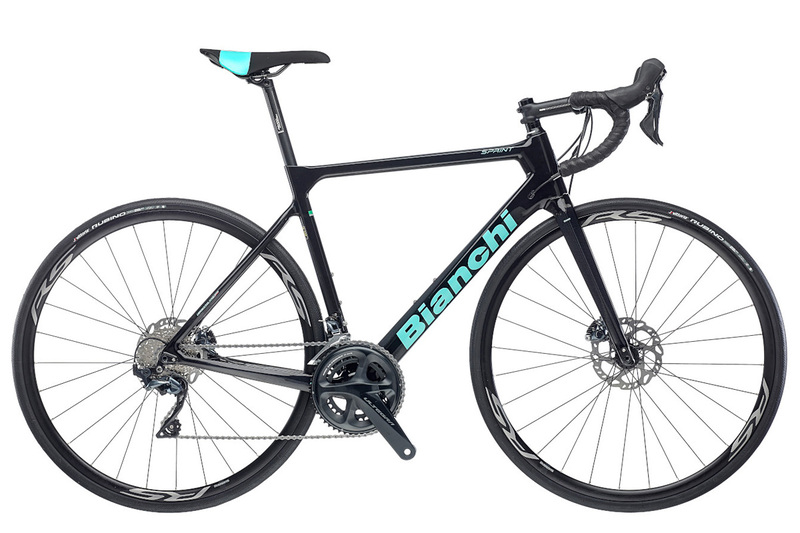 Whether you are tackling big distances in sportives and gran fondos, or actively entering the world of criterium and road racing, the Bianchi Sprint provides the perfect ride that will grow with you as your fitness progresses. 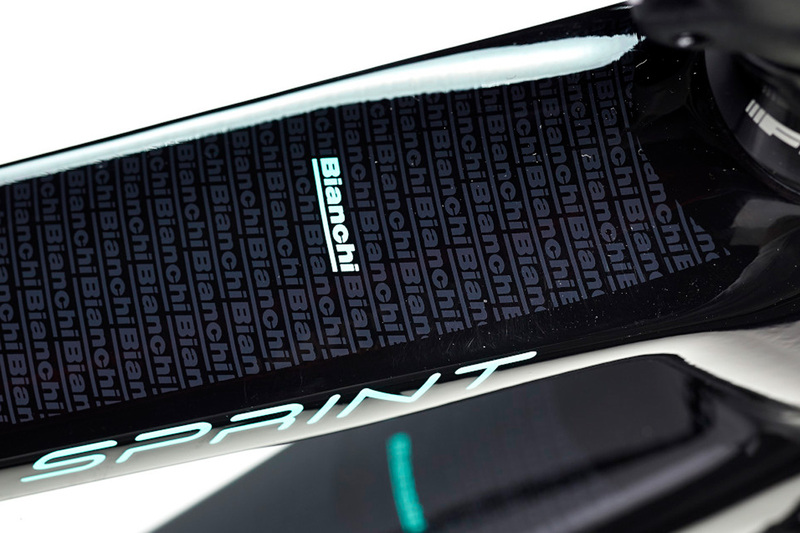 We are very impressed with the aesthetics of the new Sprint, which combine timeless Bianchi style with a pared down look that is bang up to date. No compromise has been made: it’s a sharply-designed, beautiful road carbon bike. The Sprint’s frame features internal cable routing, keeping the body of the bike clean and pared back. Full of Italian style, the design of the Sprint is sleek, clean and aggressive. 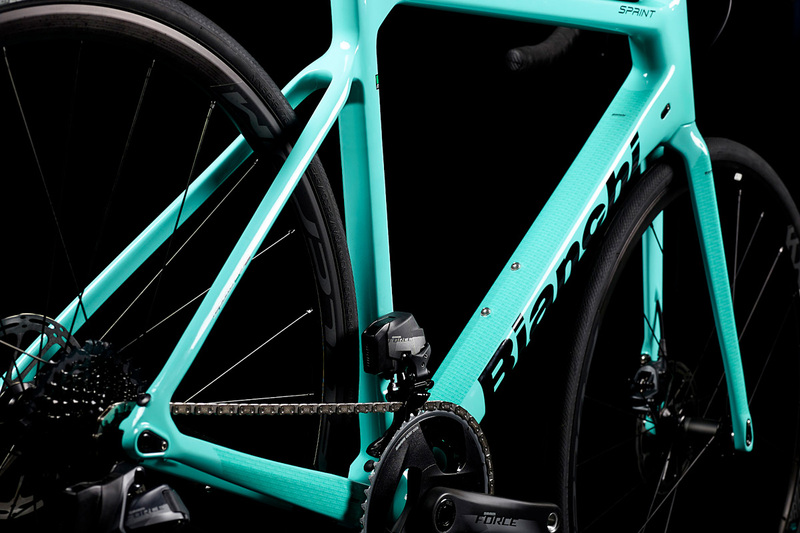 The chain stays, fork blades, top tube and down tube feature a subtle recurring graphic of the Bianchi logo – with a single instance picked out in a contrasting shade. 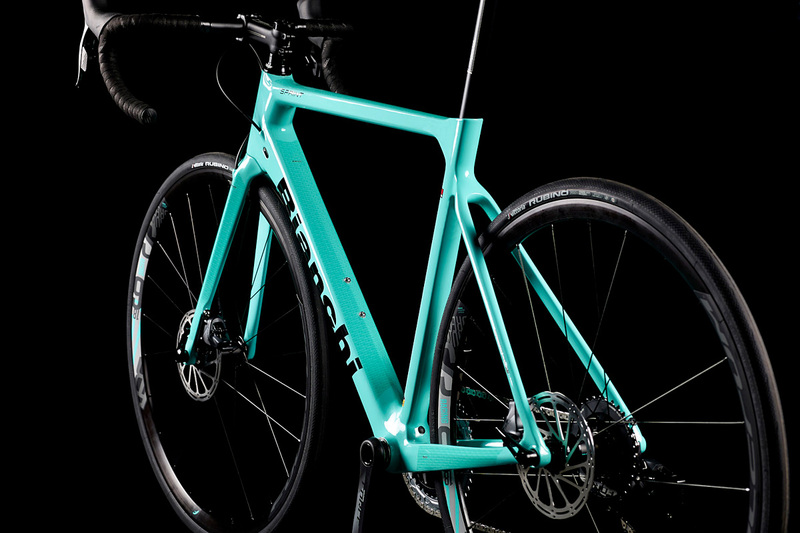 Naturally, the two colorways available feature Bianchi’s iconic celeste; one as the main frame color and the other as the accent. 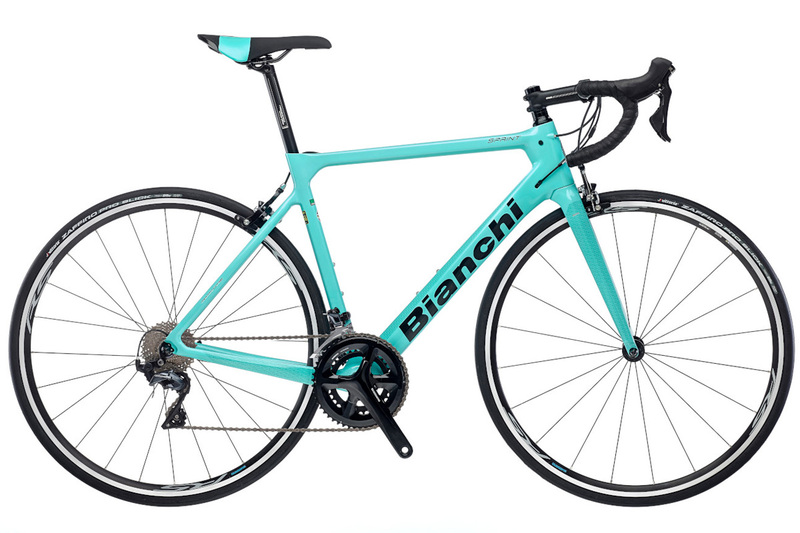 The Bianchi Sprint is available in a number of standard builds, but we can also offer a full range of complete custom specifications available in a choice of both colourways. Following their success over the past seven years we are once again offering exclusive Squadra Edition models across much of the Bianchi range that feature superb upgrades at minimal cost – such as higher performance wheels – and we also have extensive stocks of the standard specification bikes at everyday low prices. 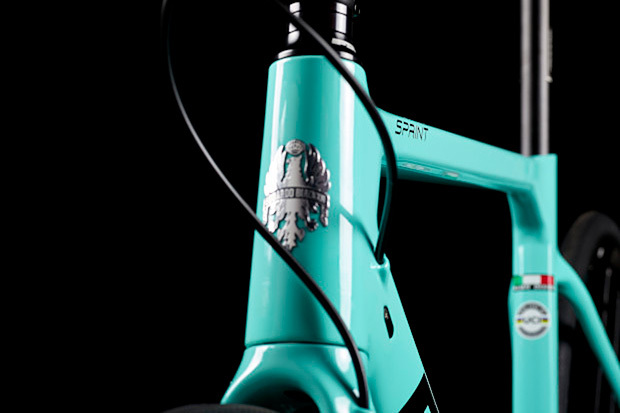 We also specialise in taking the standard Bianchi builds and either re-building or tailoring them with components of your choice to deliver a bike that meets your individual requirements. The Bianchi Sprint Disc frame and fork feature fully-integrated Flat Mount Disc brakes, delivering uniform power, increased efficiency and precise modulation for strong predictable braking, in any weather conditions. Compatible with 140 or 160mm rotors. In both the disc and rim versions cables are internally routed – with the brake hoses being fully internal in the disc brake models for a super clean look. 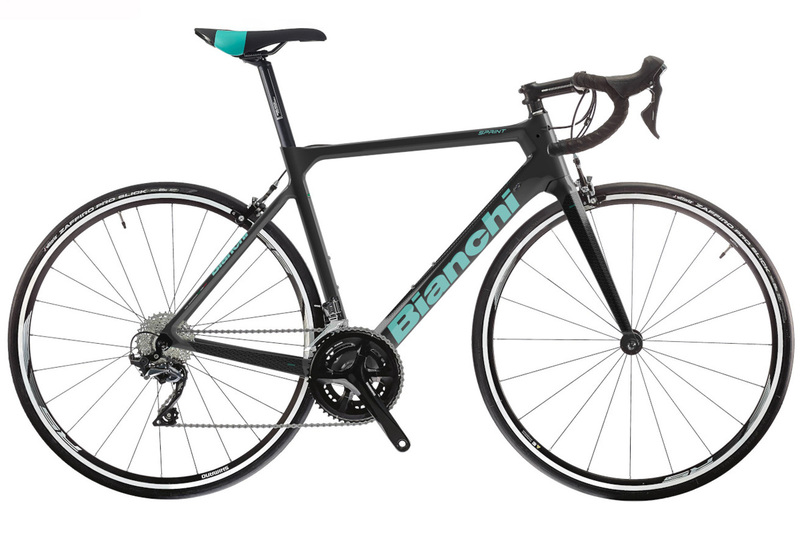 The Bianchi Sprint frame is compatible with modern larger volume tires to enhances comfort and grip without affecting rolling efficiency or speed. The Sprint Disc can accommodate tires up to 700x32c, while the rim braked models are compatible with 700x28c tires. Small but important details like the aerodynamic profile of the head tube act as further evidence of the Sprint’s elite racing DNA, while the carbon fork delivers low weight for graceful climbing and agile handling in the turns. The unisex frame geometry is based on Bianchi’s tried and tested classoc race dimensions, which offer a beautiful balance of comfort, handling and aerodynamics. Not so “low and long” that riding positions are uncomfortable on longer rides for all but elite pro-level riders, nor so relaxed that the fast hanlding nature of the bike is compromised in any way. Following their success over the past seven years we are once again offering exclusive Squadra Edition models across the Bianchi range that feature superb upgrades at minimal cost – such as higher performance wheels – and we also have extensive stock of the standard specification bikes at everyday low prices. Wheelset: Shimano RS170 Disc (standard specification). In our exclusive Squadra Edition the wheels have been upgraded to HUNT Aero Light Disc (worth £399) – complete bike just £2399. The manufacturer's RRP with standard components is £2350 – but to receive our Epic EVERY DAY LOW PRICE please see below. Or if you join Epic Cycles Club we offer up to 12% off the RRP of standard specification models. To receive our latest price for this bike in its standard specification simply enter your contact details, click on "Send Enquiry", and we will email it to you ASAP. Or give us a call on 01584 705042. To place an order, make a sales appointment, or request further information on anything at all (e.g. on custom builds, colour options, modifications, availability, or sizing etc) please also add a message below. In our exclusive Squadra Edition the wheels have been upgraded to HUNT Aero Light Disc (worth £399) – complete bike just £2699. The manufacturer's RRP with standard components is £2675 – but to receive our Epic EVERY DAY LOW PRICE please see below. Or if you join Epic Cycles Club we offer up to 12% off the RRP of standard specification models. Wheelset: Shimano RS100 (standard specification). In our exclusive Squadra Edition the wheels have been upgraded to DT-Swiss P1800 (worth £335) – complete bike just £1889. The manufacturer's RRP with standard components is £1850 – but to receive our Epic EVERY DAY LOW PRICE please see below. Or if you join Epic Cycles Club we offer up to 12% off the RRP of standard specification models. In our exclusive Squadra Edition the wheels have been upgraded to DT-Swiss P1800 (worth £335) – complete bike just £2109. The manufacturer's RRP with standard components is £2100 – but to receive our Epic EVERY DAY LOW PRICE please see below. Or if you join Epic Cycles Club we offer up to 12% off the RRP of standard specification models.